Imagine a world where mosquitoes are as harmless as houseflies because they don't care to bite humans. A world where endangered species and delicate ecosystems are saved from invasive rodents without the use of poisons, and toxic pesticides are obsolete because harmful pests prefer to eat something else. A world that precisely solves ecological problems using biology itself. 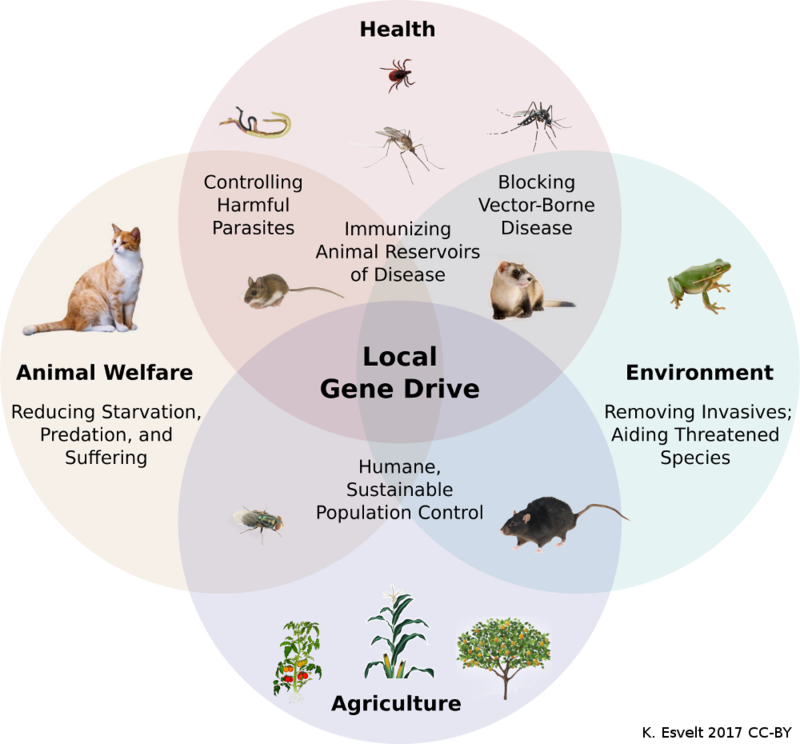 Gene drive systems could make this vision a reality by altering the traits of wild populations. In an ideal future, every community of people would be able to decide the fate of its own shared environment without forcing its decisions on others. Unfortunately, standard gene drive systems based on CRISPR genome editing aren’t up to the task. They’re anticipated to be invasive, meaning they could spread if only a handful of altered organisms are released into the environment, and self-sustaining, meaning they could keep on spreading until they affect most populations of the target species everywhere in the world. We need something better. Our international team aims to solve this problem with “daisy drive”: a self-exhausting form of drive system that uses up critical genetic fuel until it stops. Current mathematical models suggest that this built-in and tunable limitation prevents them from spreading beyond a limited, pre-determined geographic area. As a result, effects are predicted to be local and temporary: absent further intervention, a population affected by a daisy drive system would eventually return to its original state. Importantly, daisy drives might one day be safely tested in the field without risking unintended spread, yet efficiently scaled up to affect large polities without needing to release large numbers of organisms. In short, daisy drive systems could allow local communities to follow the two main rules of engineering complex systems: make the smallest possible change capable of solving the problem, and start small before scaling up. Potential applications of daisy drive and other local drive systems. Daisy-chain, daisyfield, and daisy suppression drive systems. In a daisy-chain drive, the components are arranged so that each ensures that the next one in the chain is inherited by nearly all offspring. This form of inheritance-biasing is how gene drive systems spread. Since the daisy element at one end of the chain doesn’t enjoy this advantage, it’s lost in half the offspring, leading to loss of the next element in the chain, and the next, and so on until they’re all gone and the drive stops spreading. 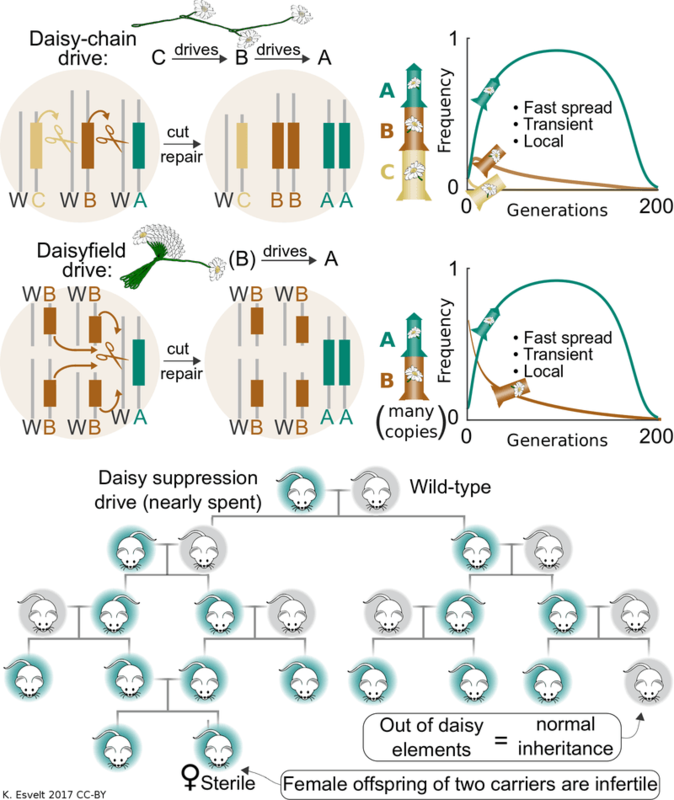 In the related “daisyfield” variant, many daisy elements favor inheritance of the desired alteration, but they themselves are inherited normally, meaning half are lost every generation until the drive is eliminated. In theory, either form of daisy drive can be kept even more closely confined within the boundaries of a particular geographically defined community by adding what we call a “daisy quorum” effect. It works by making natural selection favor either the altered gene or the original version once the daisy elements are gone, depending on which version is more abundant. How can this be done? By swapping the positions of two genes that are critical for survival. Random inheritance then makes hybrids unfit because half their offspring won’t inherit one copy of each, and consequently will die. Whichever version is in the minority will rarely encounter their own kind, so most offspring will be hybrids, causing that version to be weeded out by natural selection. We hope this will allow an interested community of people to alter a local population of organisms without affecting neighboring communities who prefer to keep the original version. Selection would keep the populations distinct by eliminating genes that cross the political boundary in either direction. A daisy quorum drive system could stably alter the local wild population in one community while leaving neighbouring communities unaffected. Importantly, we might be able to use daisy quorum drive to restore any edited population to its original wild-type genetics. 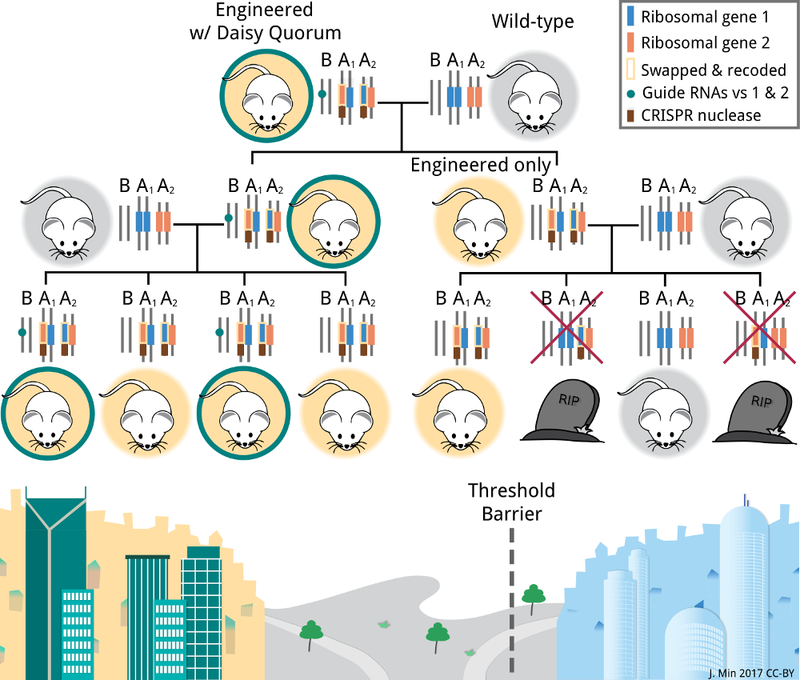 Overwriting and replacing every copy of the unwanted genetic change with a quorum element, then ensuring that engineered alleles are in the minority, is predicted to result in natural selection eliminating all of the engineered genes from the population. This isn't ecologically important, because the environment doesn't care about the exact original DNA sequence. But many people do care, and it's their environment too. Daisy drive is a mostly theoretical technology, which is why we’re excited that our international team of collaborators has been chosen to develop it in the laboratory with support from DARPA's Safe Genes program. Broadly speaking, our plan is to test and optimize daisy-chain, daisyfield, and daisy quorum drives—including for daisy restoration—in fast-reproducing laboratory populations of worms at MIT. These experiments will not only help us learn how to optimize daisy drive function, but also how these systems will behave and evolve in large connected populations similar to those found in the wild. Lab research in worms will aided by improved genome editing methods developed by Hive Biosystems, and supported by detailed mathematical models generated by team members at Harvard. Meanwhile, those of us at the Pirbright Institute will use these findings to build daisy drive systems intended to suppress populations of up to three species of disease-causing mosquitoes: Aedes aegypti, Culex quinquefasciatus, and possibly Anopheles gambiae. The results of tests and large cage trials involving these mosquitoes will inform detailed risk assessments of the daisy drive mosquitoes. These analyses will be led by our team members at the Harvard School of Public Health, and will involve not only scientists, but also representatives of environmental NGOs and communities that might one day be interested in deploying them. We will not make any self-sustaining gene drive system capable of spreading in the wild, nor will any of our experiments release engineered organisms of any kind. The policy experts among us will work closely with government agencies to explore how this novel technology might be regulated should there be sufficient community interest to one day conduct field trials. Meanwhile, our ethicist colleague from the University of Groningen will work with Safe Genes ethicists and community experts to ensure our work is broadly inclusive and ethically sound. Why so much focus on ethics and community involvement? Because even if daisy drive technology works perfectly, many people are justifiably concerned by the idea of altering wild organisms, and especially with the possibility of accidental or deliberate misuse. It's a concern our team shares: we believe that scientists should always hold themselves morally responsible for the consequences of their work, and several of us played key roles in developing standard CRISPR-based gene drive. One way we’re trying to fulfill our obligation is by developing local—and therefore safer and arguably more ethically justifiable—versions of the technology. Even so, no one should just take our word for this. We chose to tell the world about the potential of CRISPR-based gene drive before we even tested it in the lab for a very simple reason: conducting this kind of research behind closed doors actively denies people a voice in decisions that could one day affect them. In preparation for this research project, we have already “pre-registered” all of our ideas and intended experiments involving daisy-chain, daisyfield, and daisy quorum drive systems on the preprint server bioRxiv. All of our research proposals involving gene drive are publicly available. Most importantly, the complete Statement of Work for our DARPA Safe Genes contract—which is a detailed technical description of exactly what we plan to do—is available for everyone to scrutinize. To anyone with concerns, technical or otherwise: please share them with us, or with the world more broadly. We can't think of everything, and science works best by inviting others to prove us wrong. When it comes to powerful new technologies, even those that are inherently local, sharing wisdom is a practical necessity.